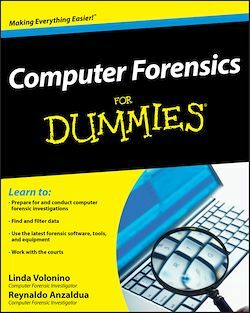 Uncover a digital trail of e-evidence by using the helpful, easy-to-understand information in Computer Forensics For Dummies! Professional and armchair investigators alike can learn the basics of computer forensics, from digging out electronic evidence to solving the case. You won’t need a computer science degree to master e-discovery. Find and filter data in mobile devices, e-mail, and other Web-based technologies. Plus, Computer Forensics for Dummies includes lists of things that everyone interested in computer forensics should know, do, and build. Discover how to get qualified for a career in computer forensics, what to do to be a great investigator and expert witness, and how to build a forensics lab or toolkit.